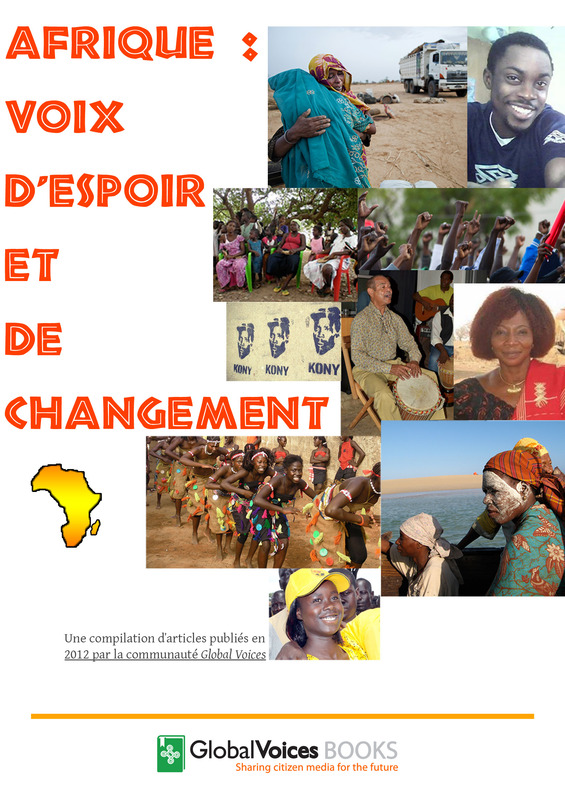 Our second ebook is now available in French: Afrique : Voix d’espoir et de changement. This entry was posted in General on August 28, 2013 by Mohamed Adel. Our second ebook is now available in Spanish: Voces africanas de cambio y esperanza. This entry was posted in General on August 17, 2013 by Mohamed Adel. 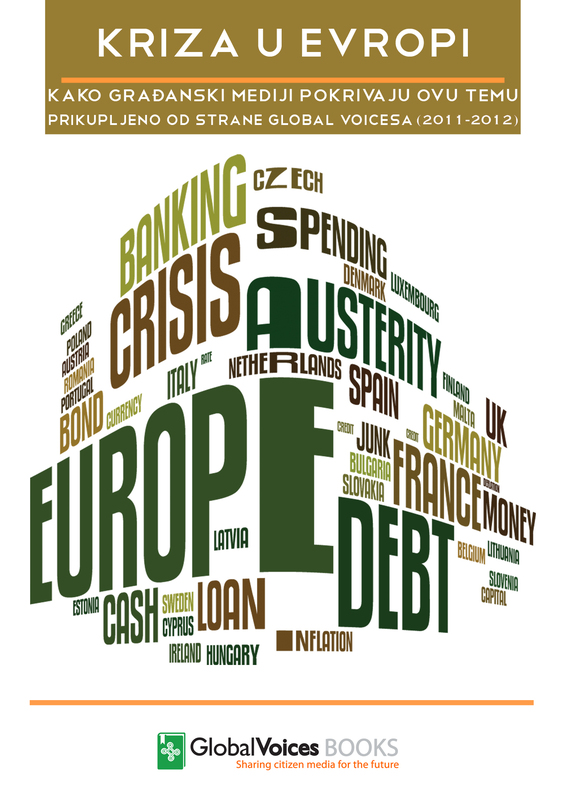 Our ebook “EU in crisis” is now available in Serbian! This entry was posted in General on August 11, 2013 by Mohamed Adel. Three months ago we started uploading our e-books on various online libraries and platforms, such as Internet Archive, Google Books, Isuue and Scribd. And here is a nice infographic detailing read, view and download statistics for each site. Enjoy! This entry was posted in General on May 22, 2013 by Mohamed Adel. 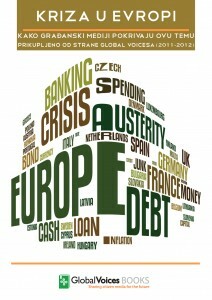 Our ebook “EU in crisis” is now available in Greek! This entry was posted in General on May 9, 2013 by Mohamed Adel. Et voilà: “EU in crisis” in French! 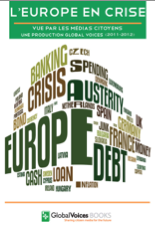 Our ebook “EU in crisis” is finally available in French! This entry was posted in General on April 2, 2013 by Bernardo Parrella. 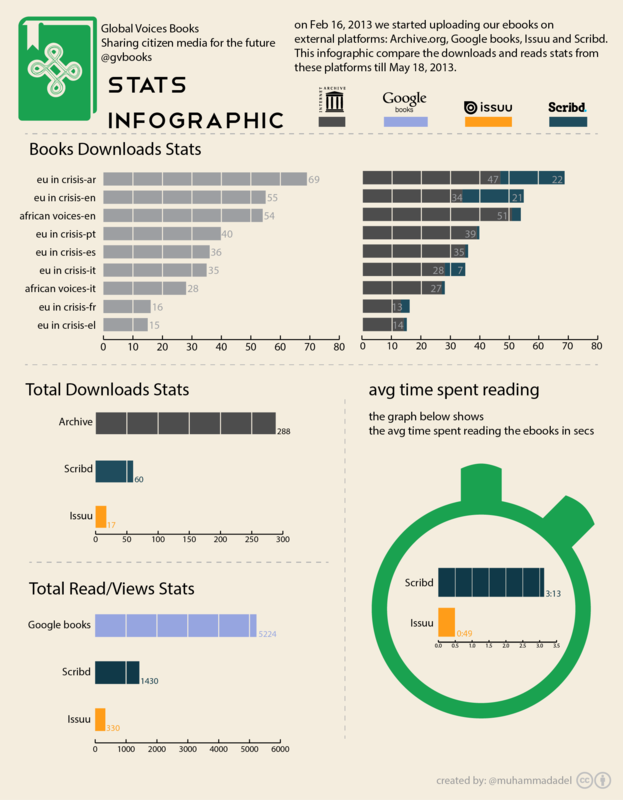 Here are some statistics about ebooks reads and downloads so far. Please note that data from this GV Books website are approximate and overall it received more than 500 visits since its inception (May 30, 2012). Data from the three external platforms are accurate and cover the first 10 days of our presence there (mid-February 2013). 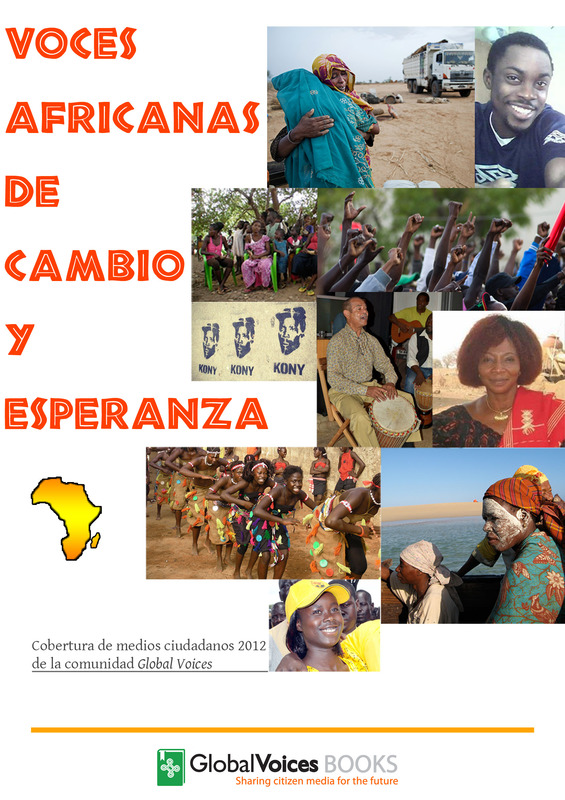 – “African Voices…”: 38 in english, 4 in italian. This entry was posted in General on February 27, 2013 by Bernardo Parrella. 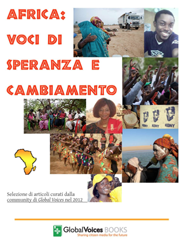 Our second ebook “African Voices of Hope and Change” is now available also in Italian — Africa: Voci di speranza e cambiamento. A special thanks to our Italian translators involved in this project: Elena Marrone, Giorgia Lanciotti, Juana Romandini, Katia Gerussi, Manuela Beccati, Manuela Dal Castello, Simona Galentino, Stefania Gliedman, Stefania Greci, Valentina Di Bennardo, Valentina Gazzola. And thanks to Mohamed Adel for his exciting technical support! This entry was posted in General on February 8, 2013 by Bernardo Parrella. 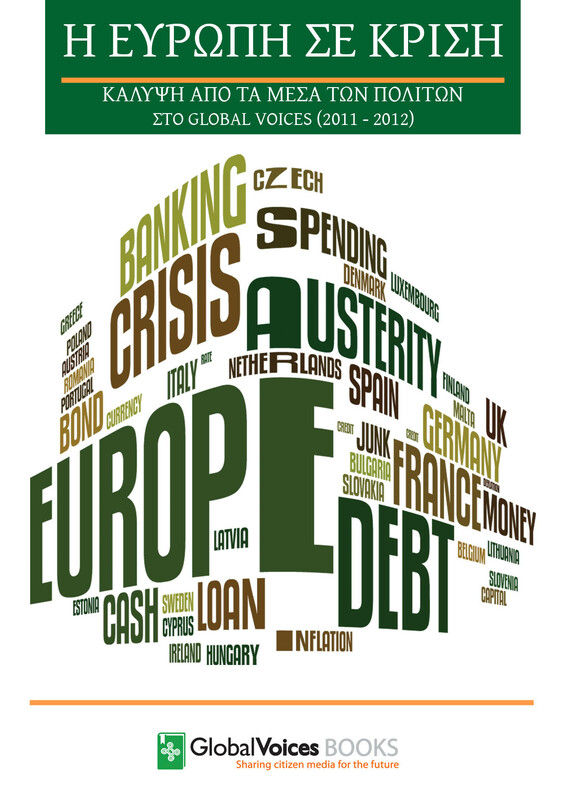 Pleased to announce that our ebook Eu in crisis is now available also in Portuguese! This entry was posted in General on January 29, 2013 by Bernardo Parrella. Here are a few excerpts from the introduction of our new ebook, African Voices Of Hope and Change — enjoy! At the start of the new millennium, it felt as though the African continent was essentially written off by the international community. The Economist magazine even ran a cover story in May 2000 dubbing Africa “The Hopeless Continent”. The bottom line was that given the difficulties the world saw in helping African nations overcome their conflicts and economic despair, we might as well just give up on the entire continent. How quickly things have changed since then. Recent statistics suggest that nine of the fastest-growing economies in the world are in Sub-Saharan Africa. The Economist acknowledged the turnaround in December 2011, featuring another cover story on Africa, this time calling it the “Rising” continent and with a far different tagline: “the continent’s impressive growth looks likely to continue”. 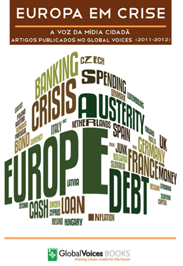 […] Yet for all the optimism and growth potential, the road to sustainable prosperity is fraught with perilous cliffs and roadblocks. According to the International Monetary Fund (IMF), the Sub Saharan Africa’s Gross Domestic Product (GDP) grew “by 5.5 per cent in 2011 and 5.8 per cent projected in 2012 (in real terms)”. However, the five countries with the highest income inequality in the world, based on the World Bank GINI coefficient, are all from the same region (Seychelles, Comoros, Namibia, South Africa and Namibia). This entry was posted in General on December 29, 2012 by Bernardo Parrella.